This is a great craft to use up any large pieces of scrap fabric you have laying around. All the fabric I used for these capes I had left over from making baby blankets and pajama pants. Bringing the cost of these capes down to a big fat $0! PERFECT! Even if you don’t happen to have fabric scraps at your house, head over to Joanns (my favorite fabric store! BTW) with your 40% off coupon in hand, and I am sure you wont spend more then $2! 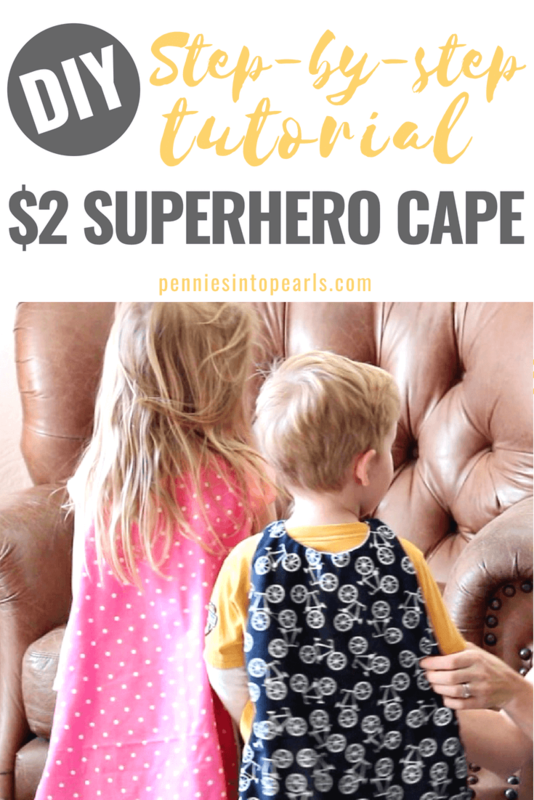 These DIY superhero capes have been a HUGE hit in our house. My daughter was excited to have one that was “superhero” but still very girly! Our little guy pretty much lives in his cape! The first thing you are going to want to do is go over to Create Kids Couture and print off your free template. 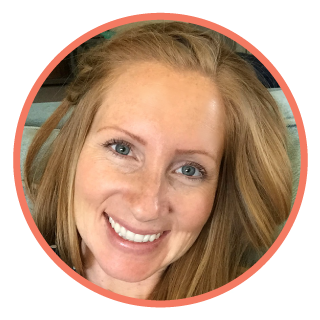 While you are over there, check out all the super cute projects for kids they have going on! All really great ideas to keep everyone busy during school breaks OR perfect ideas for DIY gifts for kids! Print and put together your pattern. Lay the pattern on top of your folded pieces of fabric. Pin in place making sure to line up the “fold” line of the pattern with the fold of your fabric. Cut out fabric making sure to not cut the side of the fold. You should now have two separate pieces of cut fabric that both look like a really cool cape! Lay one piece on top of the other with the “good sides” of the fabric facing in towards each other. Pin in place. With your sewing machine, sew a half-inch seam all the way around the cape except for leaving a 4 inch opening. Once finished sewing, turn the cape right side out by gently pulling the fabric out through the opening. The skinny ends that are used around the neck might be hard to turn right side out. I used a skewer to gently help push the fabric through. Use a hidden stitch to close the opening once it is turned right side out. Cut off a small piece of Velcro and pin in place at the ends of the neckties. Sew to attach in place. 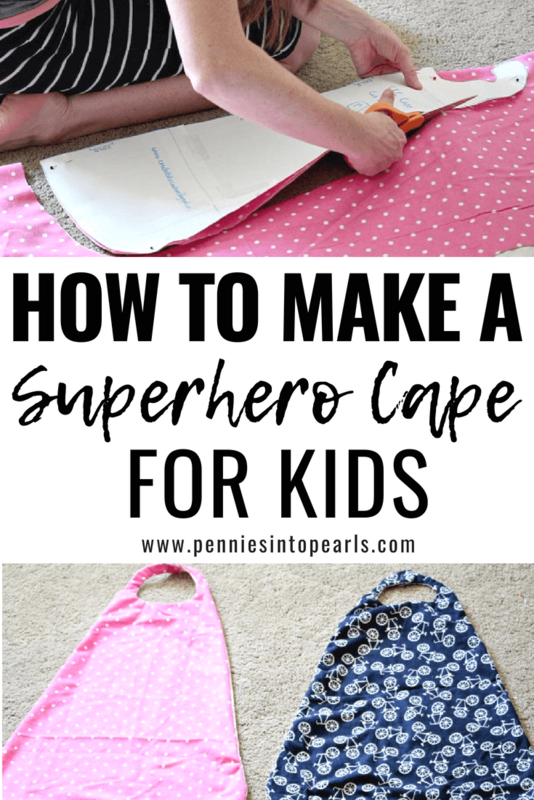 One thing I love so much about these DIY superhero capes is that they took me just about half an hour to make both, and because I used whatever fabric I had laying around, we have one way girly superhero cape and one super fun boy cape. My kids put these DIY superhero capes on at least once every single day. They are SO much fun! I would love to see how your project turns out! Do your kids love them!? Tag me on Instagram @PenniesIntoPearls so we can all see what a great job you did!